Firefighter emergency responders routinely face work-related stresses. Violent, graphic incidents are a well-documented but unavoidable part of the job (Fisher and Etches 2003; Meyer et al. 2012). So, too, are the risks for behavioral health problems associated with those stresses (Sliter et al. 2014 ; Wilmoth 2014 ). Wilmoth, J. A. (2014, May-June). Trouble in mind. Special report: Firefighter behavioral health. NFPA Journal. Quincy, MA: National Fire Protection Association. 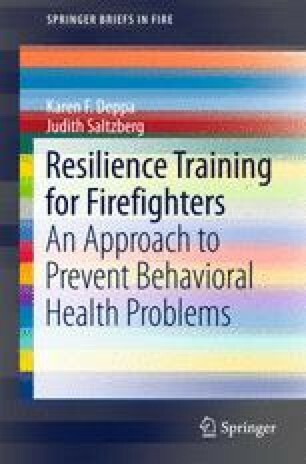 Retrieved from http://www.nfpa.org/newsandpublications/nfpa-journal/2014/may-june-2014/features/special-report-firefighter-behavioral-health. Accessed 27 Feb 2016.